The Maryland Paratroopers pose for a photo in Madrid after their third place finish. L-R: MSSE student Rohit Nambiar; visiting AE grad student Vincenz Frenzel; advisor Dr. Huan “Mumu” Xu (AE/ISR); senior AE/CS undergrad student Mathew Vaughn; AE MS grad student Derek Thompson. 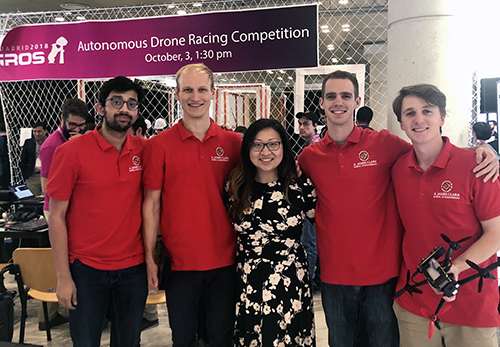 An interdisciplinary team of both undergraduate and graduate students affiliated with the Maryland Robotics Center took third place in the autonomous drone racing event at the prestigious 2018 IEEE International Conference on Intelligent Robots and Systems (IROS) in Madrid on Oct. 3. IROS is the largest and arguably most important robotics research conference in the world. The “Maryland Paratroopers” team made it through the course in about 90 seconds, placing ahead of teams from Mexico, the Netherlands, Spain, and Korea. The winning team, which completed the course in 31.78 seconds, hailed from the University of Zurich. The team, which was competing in the event for the first time, included Master of Science in Systems Engineering student Rohit Nambiar; visiting Aerospace Engineering graduate student Vincenz Frenzel; senior Aerospace Engineering and Computer Science undergraduate student Mathew Vaughn; and Aerospace Engineering MS student Derek Thompson. Assistant Professor Huan “Mumu” Xu (AE/ISR) advised the team, which received support from the Brin Family Prize and the Maryland Robotics Center. Competitive autonomous drone racing is an engineering and computer science challenge that requires an understanding of computer vision, the ability to develop algorithms that incorporate the gate detection, and programming logic for the drone to understand when it has completed tasks. Team members do not fly the drones themselves; they must program them to navigate the course on their own, flying through a series of gates, recognizing opportunities and avoiding obstacles. The objective is to complete the course in the fastest time possible. In Madrid, the competition course consisted of eight challenging gates, whose location could change during any run. Gate number six was a "jungle gym" that required the drone to detect which "quadrant" was active and only fly through that one. Gate number seven had a rotating arm the drone had to avoid while it passed through.